(CBS News) Hershey's chocolate syrup, while not traditionally known as a health food, has caught the Food and Drug Administration's attention over nutrient claims on its bottles. The FDA sent a warning letter to The Hershey Company earlier this year to change its labels that tout vitamin and nutrient-fortified syrups. In a letter dated February 14, 2012 (and published online on August 14,) the FDA warns Hershey's that its labels for "Hershey's Syrup+Calcium" and "Hershey's Syrup Sugar Free with Vitamin and Mineral Fortification" are misbranded because they don't meet the nutritional requirements to make such claims. The FDA has distinct definitions of "plus" and fortified" that say the terms can only be used on foods containing at least 10 percent more of the vitamin's reference daily intake, has to be in accordance with FDA policies on what type of foods can be fortified and has to have a reference food to compare the fortified version with. Said policies however "do not consider it appropriate" to fortify snacks or sugary foods and carbonated beverages with vitamins and minerals. The FDA also said that Hershey's Syrup Genuine product was not an appropriate reference food for the other two types of syrups, because it does not include any of the added ingredients declared on the other products. At the time, the FDA gave The Hershey Company 15 days to formally respond to the letter, outlining the actions it would take to "correct these violations and prevent similar violations." 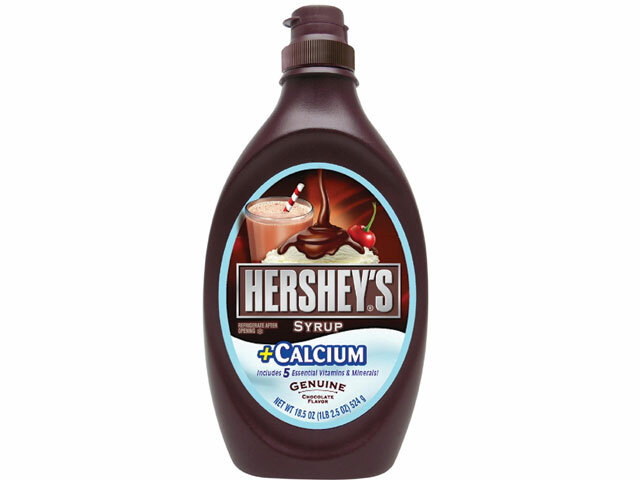 Company spokesman Jeff Beckman, told The Patriot-News in Harrisburg, Pa., that it acted quickly to make minor changes to the labels, which are now labeled as Hershey's Syrup with Calcium and Hershey's Sugar Free Chocolate Syrup. "It came down to a matter of the FDA believing that the chocolate syrup is a snack food, and that we believe it is more accurately categorized as a milk modifier, similar to products such as Ovaltine and Nesquik that have been fortified for decades," Beckman told the paper, adding that the products were not reformulated for the changes. An FDA spokesperson told The Patriot-News the case still remained open.